Five-ply laminated timber. Varnished with painted text and grahics. 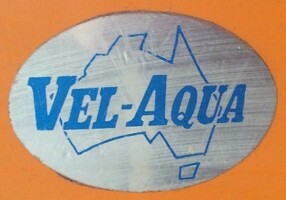 Adhesive decal. 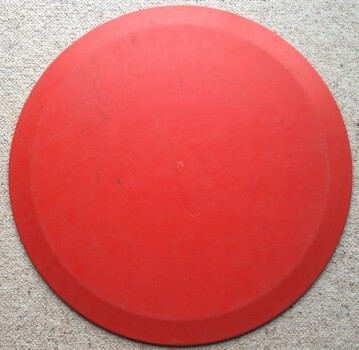 Diameter (Length & Width) : 24 inches. Deck: Round adhesive with surfboardrider and wave graphic with integrated manufacture's details. 86 Rode Road, Wavell Heights, Brisbane, Queensland. Added to surfresearch collection 11 August 2008. 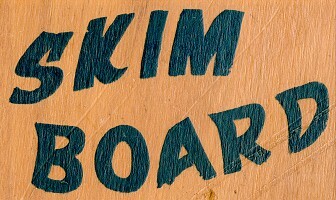 Not a wave riding board, these craft were used as a seaside dirversion in the mid-sixties. The rider would carry the board and run at full speed before lauching the it in the shallows and jumping onboard for a fast but brief ride. 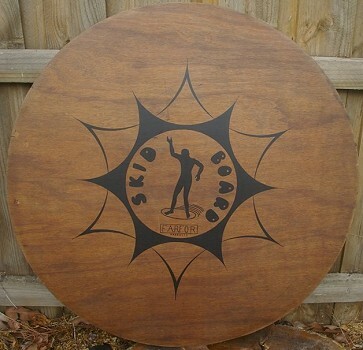 Note this skimboard is decorated with a draughtboard graphic, similar to example #37 on page 224 of Walding: Surforama (2008). 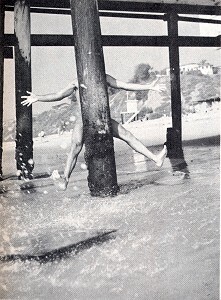 In 1964, Petersen's Surfing magazine (US) published instructions for "How to Build a Skimboard". (1964 September, Volume 1, Number 7, page 16). The design was reactivated in the late 1980s with a streamlined template which was intended, only when conditions were suitable, to be launched seaward and then turned hard off the incoming wave face. 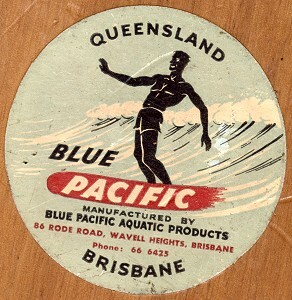 - Warshaw: Encyclopedia (2004) page 544..
Blue Pacific Aquatic Products probably built a variety of surfcraft, waterskis, canoes and recreational boats in plywood up until the early 1970s, whereafter these products tended to be manufactured in fibreglass, plastic and aliminimum. For example, see the manufacturing details of the Prot surfski, circa 1948, #328. Margan and Finney:Illustrated History (1970) Photograph, page 141. Warshaw: Encyclopedia (2004) page 544. 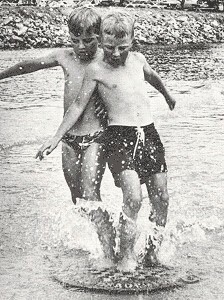 Walding: Surforama (2008) Photographs and text, page 224. Makapuu Mooks: I Can Make You a Skimboard Champion. Surfer Magazine, Volume 6 Number 3 July 1965 pages 35-37. Image right: "Don't be discouraged if things don't go right at first", page 36.
plastic, with raised graphics on the deck and a lip around the edge. 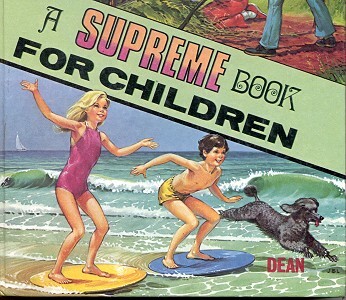 A Supreme Book for Children. 41/43 Ludgate Hill London EC4, 1973. 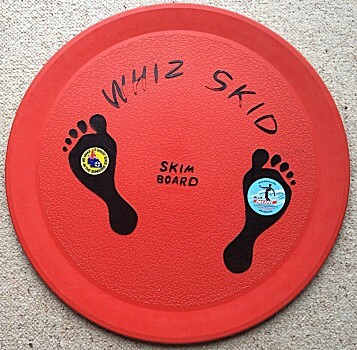 In the early 1970s, Blue Pacific Aquatic produced a line of plastic skim-boards called the Whiz Skid. 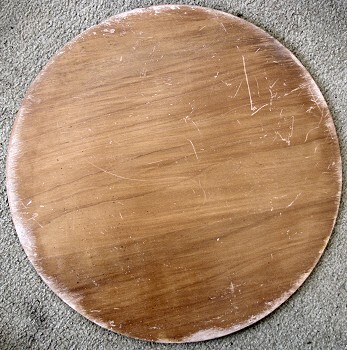 The bottom was dished with a raised lip on the deck. 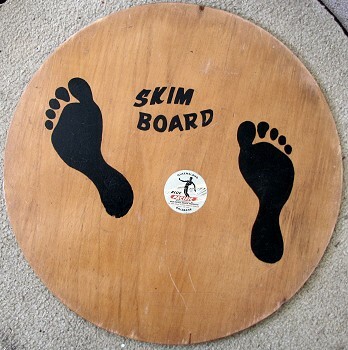 The barefoot graphics were raised on the textured deck. 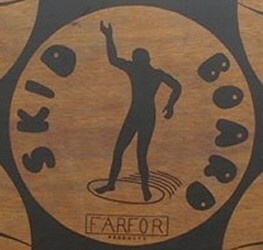 Skid Board by Farfor Products, 1968. Jamie Farfor previously manufactured Paipo boards in the early 1960s.